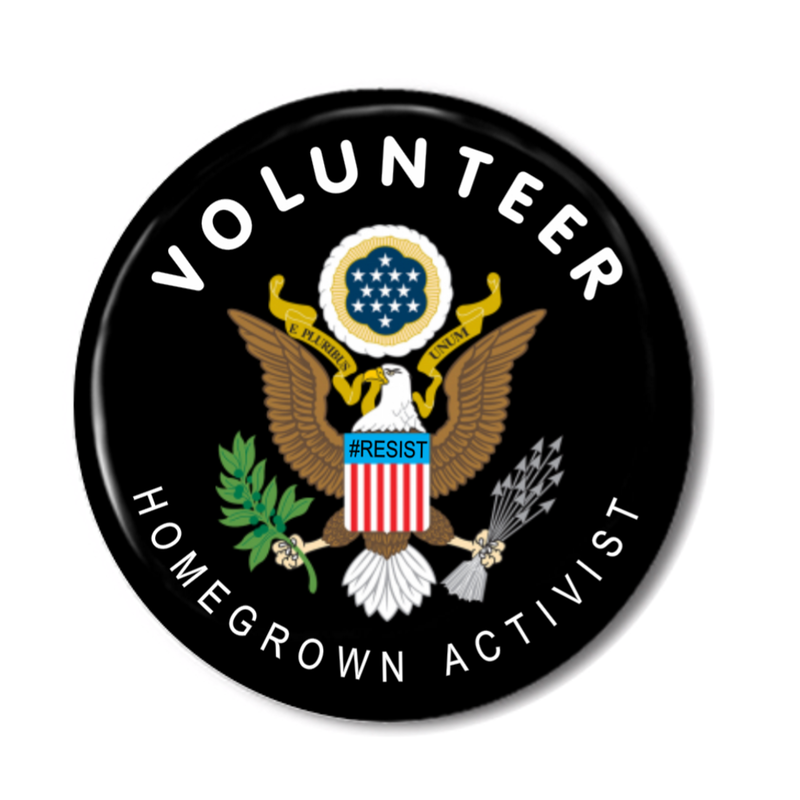 I will be downtown giving away free buttons to “snowflakes” before the GOP candidate for the 2020 Presidential Election arrives here in Youngstown for a political rally today. Yes, he is campaigning already… the man is still stuck in campaign mode, doesn’t know how to BE presidential, or maybe he just needs his ego stroked by 20,000 adoring fans cheering him on as he spews more lies. Sorry, Trump supporters… everyone is entitled to their own opinion and this is mine. Do you ever wonder why people think the way they do? You see, I grew up in the church. In the early 1960’s, my father studied at the Salem Bible Institute, which is now the Allegheny Wesleyan College, and picked up some of their fuddy-duddy ways. (For the curious, check out their current Student Expectations as posted on their website.) In 1967, we moved to Colorado Springs so my father, a tool & die maker by trade, could attend the Nazarene Bible College. He graduated in the Pioneer Class of 1970 and became an ordained minister for the Church of the Nazarene. Yes, I’m a PK (preacher’s kid) so I grew up in the glass houses of parsonage, and our life pretty much revolved around the church. Now I wasn’t a saint… I did some of the same things other kids in the church did in the 1970’s (smoke cigarettes, drink wine, toke weed) but I was relatively a “good girl” and always mindful to hide my activities. It’s not like I partook in the really sinful things like playing cards, dancing, fortification, or going to the movies… yes, I’m poking fun at the ways some things are labeled sin in attempt to control the masses. Thankfully, my parent’s fuddy-duddy ways faded off over time, God eased their convictions, but I still dressed conservatively and generally behaved myself, consciously aware of being in the public eye. Preacher’s kids are held to a higher expectation, what we do reflects on our parents, so I always tried to keep my personal life as private as possible. I was also ingrained to keep my opinions to myself, even though my father always encouraged us to think for ourselves and form our own opinions. We grew up with mixed messages on that… from “God gave you a brain, use it” to “mind your manners” and tamp it down… form your own opinions but, above all else, keep those opinions to yourself… don’t rock the boat, do not upset your mother, never embarrass your father. My mother was still reminding me to keep my opinions to myself when I was old enough to be a grandma, saying things like “people know who you are, do not embarrass your father” which really meant “do not embarrass your mother” but, oh well. It was enough to stop me from mailing a letter to an editor of their small town newspaper in 2008. Which brings me round robin right back to the topic at hand: the rise of the Religious Right… or, IMO, the infiltration of churches for the purpose of manipulating gullible people for political purposes. The separation between church and state became blurred in the early 1980’s. I was a young adult, having graduated from High School in 1978, and attending various churches, mostly Evangelical Friends, in Columbiana County, Ohio. I changed churches as political crap got to me, started arriving late and leaving early to avoid speaking to anyone, and eventually quit going to church all together. I didn’t leave God… I just left the church. You can google Religious Right, Focus on the Family, and Moral Majority if you are too young to remember what was going on back then. Odds are, your research will NOT tell you how the Republican Party infiltrated churches to manipulate people into supporting their agendas. Maybe they do, from their own perspective… my opinion was formed from my own perspective, as a Christian Democrat, from the church pew. I did not know about the Religious Right… I just knew that I was getting political propaganda disguised as prayer requests tucked into my church bulletin, complete with a phone number and what to say to echo their message. Oh yeah. Right in bulletins distributed to thousands, if not millions, of people attending church services on Sunday mornings, there would be flyers that said things like, “Please pray for your congressman as H.R.# [whatever number it was] comes up for a vote” with a word for word message of what to say when you call your congressman to ask him to vote in the specified way. That was like whoa… how many gullible people would do that? IMO, a lot of church people would make the call and echo word for word, without a second thought… hey, it was in the bulletin, the church asked us to pray and call our congressman. To disagree with the desired outcome, perhaps you wanted your congressman to vote the other way, was equivalent to disagreeing with the church… how dare you disagree with God’s will. By the way, I called the phone number that was in the fine print on one such prayer request years ago, politely asked what denomination they were affiliated with, and the woman who answered the phone explained that they distribute political “prayer requests” to churches, but are not affiliated with any denominations or religious organizations. Yes, exactly as I suspected… manipulation of church people for political gain. It didn’t end there. Right to Lifers started tucking anti-abortion pamphlets under windshield wipers of vehicles parked in church parking lots and some (but not all) ministers started telling their congregations how to vote. What’s a Democrat supposed to do when the message from their church comes across loud and clear, “Vote Republican or go to hell”? 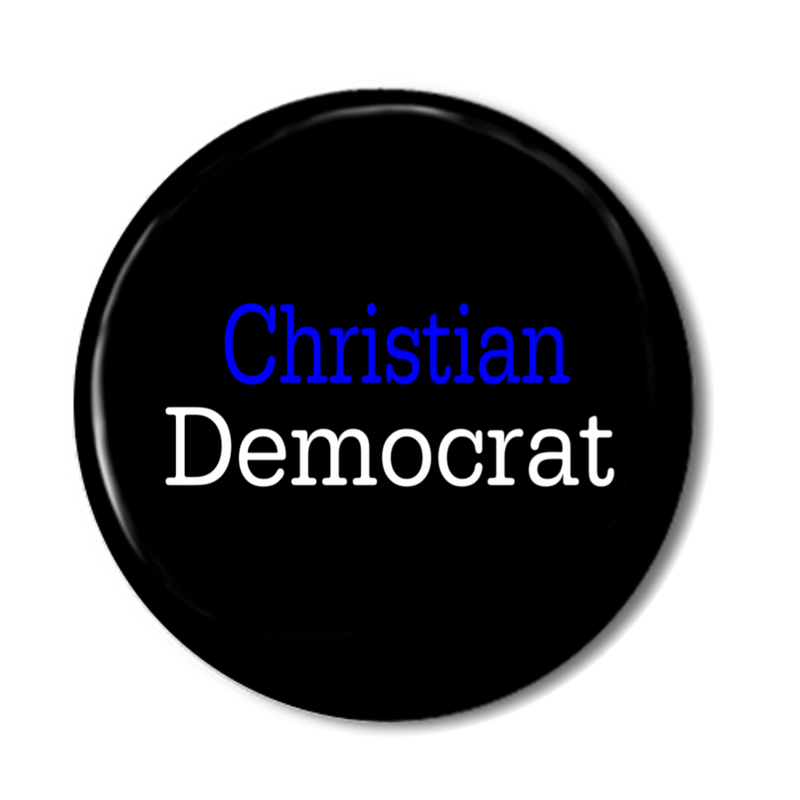 Perhaps we should have raised a ruckus, stood up for our right to have our own political opinions, but most Christian Democrats, at least those I knew, quietly went underground… best not to tell anyone who you vote for… keep those opinions to yourself, and pass on putting that sign for Bill Clinton in your yard. It seems like Jimmy Carter was the last Christian Democrat… then the Religious Right emerged, throwing their support behind Reagan to deny Carter a second term. Here’s an interesting article if you want to read a bit about that. Somehow, over the years since Jimmy Carter was our President, Christian and Democrat became opposites, oil and water, an impossible combination. By the 2016 election, Democrats were demonized. Anything or anyone remotely liberal is evil. Ironic, that is my opinion of the Republican POTUS who won by the electoral college. He is a despicable man who could do great harm to our country. 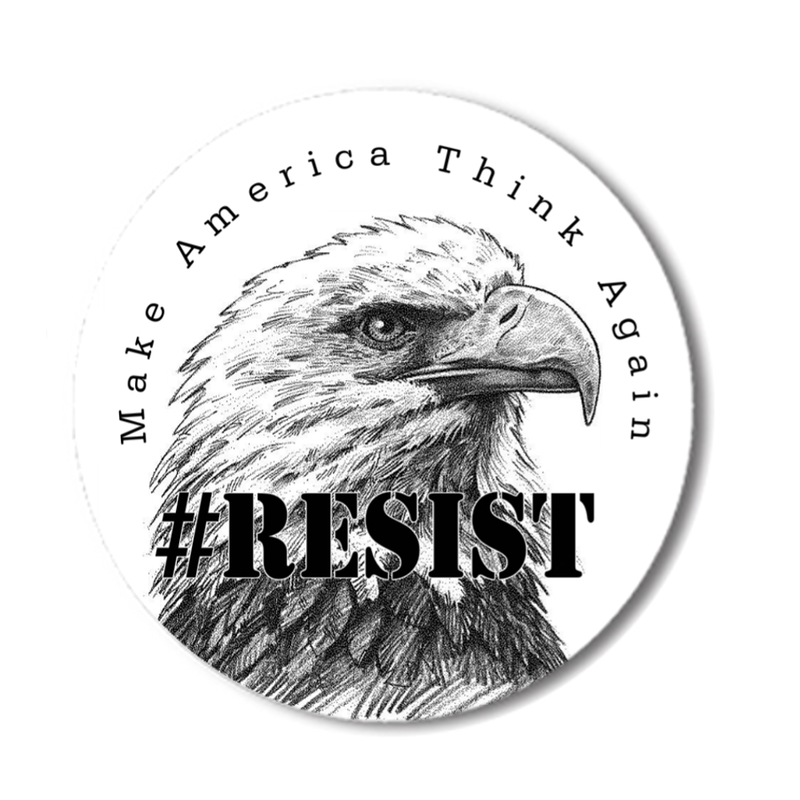 I have been relatively quiet on the subject because I have friends and family members who voted for Trump, some claiming that they were voting “for the Republican Party, not the man” and others, to be honest, just wanted a white male in the White House, any white male would do. Well, they got what they voted for… and I see what they post on social media. From the things they share to comments on threads, it blows my mind to see how they view Democrats and liberals… we are evil, out to destroy “their” country and all sorts of other nonsense. I was silent in the 1980’s, kept my opinions to myself… I cannot do that anymore. Look where being quiet got us… we let the Religious Right infiltrate our churches, let Republicans redefine good and evil by political parties, and became demonized by public opinions as expressed on social media. Straight up, I have to join the resistance. Some people won’t like it… that’s why I am writing this blog post. Fair warning, eh? Friends and family will be unfriending me on Facebook right and left… oh well. I’m too old to be quiet. FYI: I am still ye mostly blind in my right eye, but I’m learning to adapt… it doesn’t bother me to be on the computer as much as it did when I first lost sight. I don’t trust spacial relationships yet, have broken too many coffee cups by accidentally setting them too close to an edge, so I want to make actual samples before I post images of the new buttons to my online store. 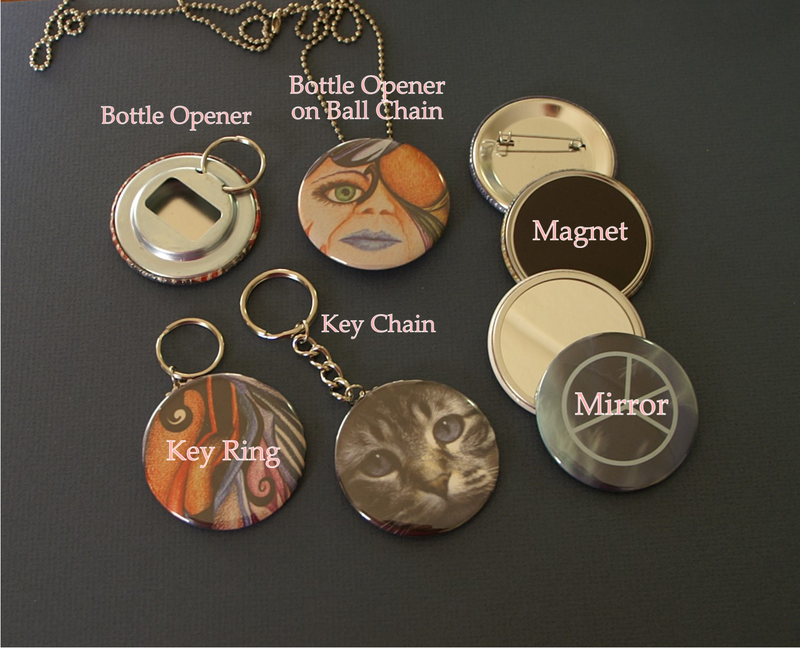 Back options for 2.25″ buttons now include pins, fridge magnets, pocket mirrors, key rings, key chains, and metal back bottle openers with split rings. Thanks for looking!